Need a calculator to dimension a circuit? ...it's more than just a hobby electronic store. The tuxgraphics ethernet board provides a web server with the possibility to control hardware and read sensors. To access it remotely over the internet you will need a DSL router with port forwarding. Most DSL routers can do that. To know where your system is you will either need a static IP address or a DSL router that can work with dyndns.org. With tuxgraphics.org/cgi-bin/checkip you can see what your current IP is. You can use this during initial testing while you do not yet have a static IP or a dyndns.org (or freedns.afraid.org) account. If you want an almost ready to use solution which does not require compiling or loading of software then take a look at our offerings for boards pre-loaded with software. The articles in this section use the same tuxgraphics ethernet board for different applications. An 8 character LCD module with some very nice features. A large four digit display that can be programmed in any way. Embedded client systems are really easy to use and they are the best solution if you want measure and monitor something over long periods of time. Pool timer and temperature measurement in one unit conveniently operated from a smartphone or web browser on the PC. Use your phone (iPhone, Android phone, any data capable phone) as a garage door opener. A universal 24h timer with a nice web based graphical user interface. A small hardware watchdog to supervise your network equipment. This watchdog is as well known as "SNMP voltmeter". It can measure voltages in addition to monitor network equipment with ping. How to have more digital output pins on the IO-web server. An automatic garden watering system that allows you to take care of your garden even when you are away from home. A description on how to connect the tuxgraphics ethernet board over WI-FI by using a WI-FI AP-Client. A web to Modbus/TCP-server gateway. Monitor indoor humidity (SHT11) and temperature as well as outdoor temperature (DS18S20). You can switch a relay remotely to control e.g. the heating in your summer cottage. An electronic garden watering system that allows you to take care of your flowers and vegetables even when you are far away. Lawn sprinkler control over the internet! Display temperature sensor (DS18S20) readings on the web and plot historic data. In addition to displaying temperature data you have the option to switch something on or off over the internet (e.g heating or air conditioning). All this is done with the tiny tuxgraphics avr ethernet board. The tuxgraphics TCP/IP stack is as small and fast as always but has now new functions for web clients, email and twitter.com/identi.ca. We have now a dns resolver library. A more advanced version of the tuxgraphics web-server software controls equipment on the outside of an airplane. You can however also use it if you do not have an airplane ... Very useful of home automation. 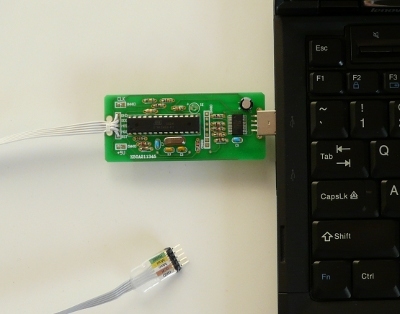 How to use the ethernet board to remotely wake up PCs on the LAN. How to use the ethernet cable to supply power to the board. How to control IO-pins or read data remotely with less than a millisecond delay. A small circuit with some software to remotely reset/reboot other equipment. Just add this one SHT11 sensor. No other components are needed to measure temperature + humitidy + dew point. Add a sensor board to the avr-webserver/ethernet board and ready is the web enabled weather station with local LCD display. Here is another example on how our general purpose avr Ethernet board can be used. It's also interesting if you don't plan to attach a LCD to you hardware as it shows how to decode http-form data. Examples of what can be done with our avr web server. The article explains also how to connect it to the public internet. A complete web server in an atmega88! It's the same hardware as the previous 2006-06 article. Just update the firmware to add a web interface. A simple example application to switch on or off a relay via Ethernet from any computer in your network. The hardware is generic and ready for more complicated future applications. Welcome to the fascinating world of small microcontroller Ethernet devices based on the ENC28J60 Ethernet chip. The software described here uses only UDP but click on the article above for a web-interface. A nice desk top clock that has always correct time and date. This is a new design of our popular NTP-clock. A nice clock that has always correct time and date thanks to the Network Time Protocol. This is and older version of our ntp clock as designed in 2007. Make your oscilloscope show the current time! A modern programmer for Atmel AVR microcontroller with USB interface. This one has no "chicken and egg" problem. That is: You can build it without building first a programmer to program the programmer. A bit of background information about the programmer connector we use. A very small an really good DC bench power supply unit for your hobby lab. It has lots of features which you normally find only in very expensive power supplies. This one is affordable, small and easy to build. A small handheld USB-stick alike device to scroll forward and backward the slides of your presentation. We build a simple and inexpensive three digit display. It's a voltmeter module but it has also gerneral purpose digital IO pins. In this article we build not only a thermometer but see also how to interconnect a microcontroller to a linux PC over a physical RS232 interface without the extra MAX232 chip. The I2C protocol is used for the communication. How to build a recent version of avr-gcc for Linux (mac, freebsd and windows are also explained). Soldering is great fun. This is an introduction for people with no or little experience. How to program the Atmel AVR Microcontroller with GCC. This is an old article. The updated and new C-programming tutorial can be found above. Which one is the right adapter? Light fixtures and light bulb sizes for common household light bulbs. Will this light bulb fit?